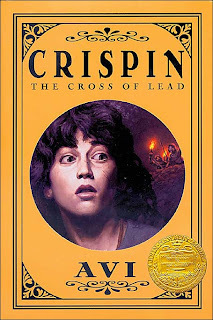 Set in Medieval England, Crispin: Cross of Lead tells the story of a 13-year-old peasant boy - called Asta's Son - who becomes orphaned when his mother dies. He has no kin and few friends in his village, where he and his mother were always treated as outsiders. Distraught, he hides in the woods, where he overhears a disturbing conversation between his cruel feudal master Lord Aycliffe and a stranger. Although the words exchanged make little sense to Asta's Son, he senses the men are discussing his own situation. When the feudal lord spies the boy, a chase ensues, and Asta's Son narrowly escapes. After spending a night in the forest, the boy creeps back to his hut, only to see soldiers burning it to the ground. Stunned, Asta's Boy cannot understand what is happening. At nightfall, he creeps to the town church to seek help from the only friend he has left - Father Quinlen. The priest presents Asta's Boy with a leaden cross, which belonged to his mother. On the cross is printed words the boy can't read - Father Quinlen promises to read to decipher the writing later. The priest also gives the boy another gift, the name with which he was christened - Crispin. Father Quinlen further explains to Crispin that he has been declared a "wolf's head" - a wanted criminal, who is to be shot on sight - by Lord Aycliffe. The charge is thievery, although Crispin has done nothing. Mystified, Crispin creeps back into the woods, promising to meet Father Quinlen the next night, when the priest will help him escape the village. Crispin keeps the appointment, only to find his friend dead. In abject terror, Crispin flees, heeding the priest's warnings to run for his life. Lost and hungry, the boy wanders into a deserted village where he encounters a huge, red-headed juggler named Bear. The man commands Crispin to be his servant, but the boy soon realizes that he is freer with Bear than he has ever been. Still, Lord Aycliffe pursues the boy, and Crispin cannot be wholly certain Bear will not betray him for a reward. As Bear and Crispin travel to Great Wexley for a grand festival, they attempt to make sense of Crispin's mystifying situation. The solution appears to be connected to the writing on Crispin's lead cross, writing which remains undeciphered. Once in Great Wexley, Bear and Crispin find themselves in more danger than they could have possibly imagined. As they close in on the truth, they must risk their necks to save their lives. Although I won't give away the ending, I will say that Crispin survives to continue his adventures in Crispin at The Edge of the World (which I haven't read yet). This Newbery Award winner gives the reader a fascinating glimpse into the bleak world of 14th Century England; its old-fashioned, formal tone just adds to the period detail. I think younger readers may be put off by the tone of the novel, but they will certainly be pulled in by the non-stop action. It's truly a grand adventure with a brave and admirable hero on a quest to find the most important thing in the world - his true identity.